This action group is working to convince the California teachers’ pension fund (CalSTRS) to divest its fossil fuel holdings by 2020. CalSTRS is one of the biggest pension funds in the world. If it divests its billions in fossil fuel holdings, it will signal that fossil fuel corporations, which put profits above the health of the planet, are social pariahs and stand outside the norms of human decency. The Divest CalSTRS Action Group is pressuring the California teachers’ pension fund, CalSTRS, to divest all its fossil fuel holdings by 2020, beginning with the most egregious climate change deniers, ExxonMobil, Chevron, and Shell. In our campaign to convince the CalSTRS Board to divest, we’ve presented the CalSTRS Board with thousands of petition signatures, made public comments during CalSTRS Board meetings, staged several rallies at CalSTRS Sacramento headquarters, and solicited written comments from community college educators which we’ve read at CalSTRS meetings. Come to a Meeting! 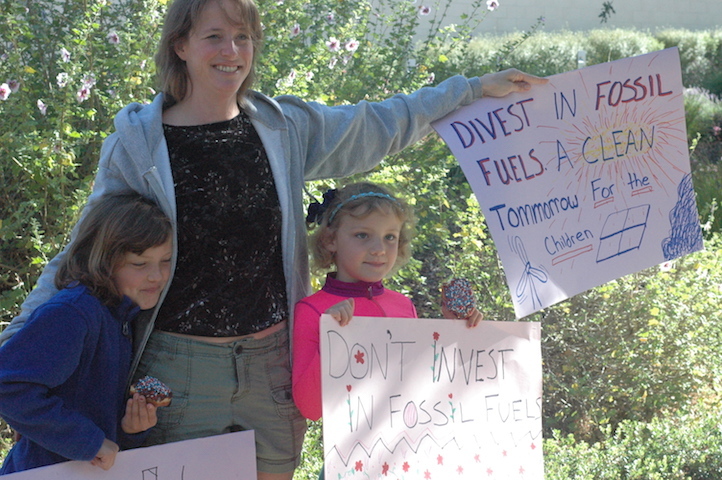 The divestment team meets the 1st Monday of every month at 6:30 p.m. at the home of a volunteer in Santa Rosa. Email divest.calstrs@gmail.com for location. Newcomers welcome! We need volunteers! Carbon Tracker, a group focused on “aligning capital with a carbon budget that avoids dangerous levels of global warming,” has an interesting article discussing the benefits of divestment versus engagement. The article states that divestment campaigns have been essential “in putting the issue of unburnable carbon on the agenda of investment institutions.” It also acknowledges the role of engagement — but engagement with teeth. As the article states, “..there is a new wave of engagement which targets the fundamentals of a company’s business model.” Check out their website for a unique take on the financial implications of the global transition away from fossil fuels and towards renewable energy.